Raymond forklifts offer a unique and popular line of forklifts, lift trucks and pallet jacks that make moving materials in your warehouse, factory or construction site easy and efficient. Their smaller size, reputation for reliability and a line of products that fit every lifting need, has made Raymond Forklift an industry leader. And while they are the industry leader, Raymond forklifts do have unique features that demand operators receive training before use. As a business owner, consider investing in a Raymond forklift training and certification program for your employees that teaches how to use Raymond forklifts safely and efficiently. ForkliftCertification.com , the leader in online OSHA forklift certification, offers three different training packages to help operators master the ins and outs of safe, efficient lift operation – including Raymond forklifts. With our Raymond forklift training courses, you’ll gain OSHA compliance faster – and more affordably – than you think. If your company uses Raymond forklifts and you need Raymond forklift training, ForkliftCertification.com offers OSHA compliant courses and affordable value. We’ll help get your entire workforce up to speed with safety training for Raymond stand up forklifts and other models. Sign up today! Raymond Corporation has been a leader in the material handling industry for many years. Their full line of electric forklifts, standing forklifts, turret forklifts and high reach forklifts set the industry standard for productivity, reliability and easy maintenance. With unique features that include ergonomic seating and controls, standing operations and new environmentally friendly features, a Raymond forklift is ideal for the business that is looking for a reliable product that will improve employee productivity and keep your business environmentally conscious. For the best Raymond forklift training and Raymond reach truck training, contact ForkliftCertification.com today. We have the training courses you need to become totally OSHA compliant. Raymond High Capacity Reach Truck – able to lift one ton (2000 lbs.) up to 505 inches. Industry-leading performance and rugged durability define this popular Raymond forklift. Raymond 7700 Reach Fork Truck – this lift is ideal for longer shifts, thanks to its ultra-comfortable design. Our Raymond forklift training reviews the important aspects of staying alert and comfortable on the job. With the 7700, you’ll need Raymond reach truck training – sign up today! Raymond Deep-Reach Forklift – if your warehouse has deep pallet bays, this Raymond forklift will assist with difficult cargo handling requirements. These are just a few of the Raymond forklifts you may end up using. Click here for their complete lineup of forklifts. What Makes Raymond Forklifts Unique? Many Raymond lifts are operated by a standing driver, not a seated driver. The stand-up feature is available on the standing forklifts, turret lifts and high reach lift lines. The idea behind the stand-up configuration is to create a lift product that has a smaller footprint, allowing more maneuverability in small aisles, and easier transportation from storage to construction site. This configuration demands that lift operators are well trained on the differences between seated and upright lift operation, and how to safely operate a Raymond stand up forklift. 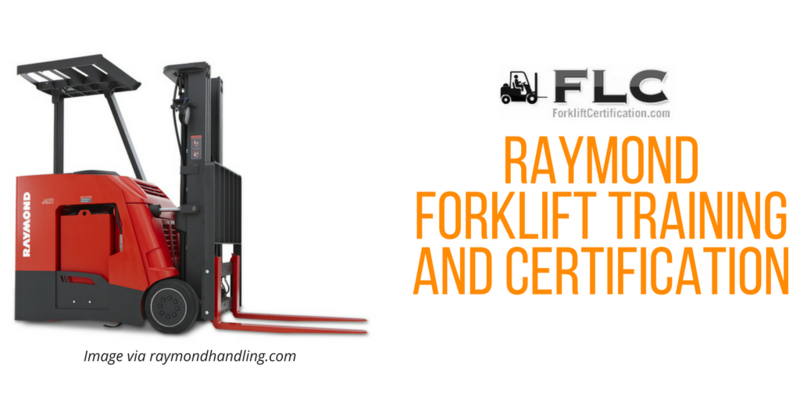 Raymond forklift training and Raymond reach truck training from ForkliftCertiifcation.com will ensure you have “stand up, standout” OSHA training credentials! Why Do I Need Raymond Forklift Training? While many features of Raymond lifts are similar to other material movers on the market, the stand-up control design does create some unique operating situations. By providing your employees with training that is specific to the Raymond line of equipment, you can ensure that your operators, even those that have many years of experience, are fully familiar with the operation and configuration of the Raymond lift. By training and certifying your employees on Raymond forklifts, you can increase productivity, warehouse safety, and reduce the incidence of accidents. OSHA compliant certifications on Raymond forklifts is a great way to keep your warehouse safe, accident-free, and fine-free. If you are looking for a reliable and reputable training source for Raymond forklifts, FCL can provide your employees with comprehensive training and certification programs for the entire line of Raymond stand up forklifts, turret lifts and high reach lifts. Create an account on our website today and receive the training you need to become a certified Raymond forklift expert. All three of our training courses (Train a Trainer, Training Kit, and Bundle Package) are ideal for anyone looking for Raymond forklift training. Get started today with your Raymond reach truck training sessions! For any questions about our forklift training modules, call ForkliftCertification.com at (888) 278-8896.